Are you a real estate agent looking for ways to sell more houses? Look no further. An open house is a great way to increase your leads and sales. This is especially true if you know successful open house tips that will give you a fast house sale. The truth is, real estate agents are making money from successful open house events. According to some real estate agents, at least 20 percent of their sales come from open house. Besides that, Chris Suarez of Experience Real Estate in Portland revealed that 23% of his business or $18.5 million in volume year-over-year is from the lead generated at opens. How do you replicate these successes to generate fast house sale in your real estate agent business? Below are four (4) open house tips for agents wishing to make a successful and fast house sale. The first open house tips for agents that can lead to fast house sale is preparation. For any venture that will succeed, there is a need to prepare. The open house property should be clean. This may mean you have to get cleaners and window washers to help you make the house look clean and spotless. Remove all the clutters, excessive accessories or personal effects so it will be easy for prospects to visualize themselves living in it. Use clean curtains and attractive flowers. The lights should be on in all the rooms and blinds open to make the house dazzling. Apart from the interior of the house, you also need to take care of the exterior. Ensure the environment is clean. Take care of the landscaping, paints, and doors. You can repaint the exterior to make it look fresh. As you prepare for the successful open house, create a sensory experience in the house to make it memorable for as many prospects as possible. It will help you grab potential buyer’s attention by appealing to their senses. Below are ideas you can implement to create a sensory experience to get a fast open house sale. Below are more preparation tips for a successful open house and a fast house sale. Use fresh and clean linen. All these things will stimulate the senses of potential prospects and it will give them a lasting memory. The second open house tip for agents that wants a fast house sale is “promotion“. The second open house tip for agents is promotion. It is not enough to prepare the house and wait for prospective clients to come and inspect or buy it, you must promote it if you want a fast house sale. Promoting the open house will create an awareness of the property. 1.Bring out yard signs: Design clear, huge, bright and visible yard signs and place them in strategic places such as the route that leads to the open house. 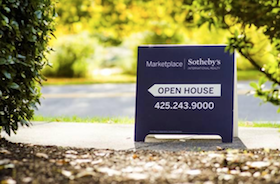 Yard signs will help you drive enough foot traffic to your open house. 2.Create Facebook ads for the open house event: Create an event on Facebook and boost it to reach a more targeted audience. You can target users who are interested in websites like Trulia and Zillow. 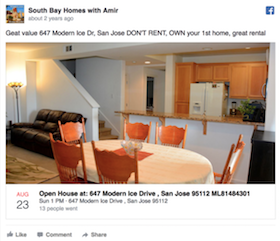 A good example of this is South Bay homes with Amir open house event ad on Facebook. They created the event ad for their open house to make it easy for people to sign up and also mark the date on the Facebook calendar or notification. 3.Use automated services like Listhub. Subscribe to Listhub. It is a service that will help to push your open house to big websites like Realtor.com and Zillow. 4.Make a post on other social channels about the event: Post your open house event on Facebook Twitter, Pinterest, and Instagram for a successful open house that can lead to fast house sale. Posting to different social media channels can help you create more awareness and also encourage your followers to share. 5.Engage in door knocking: Go to houses close by and knock on the doors to speak to them face to face to intimate them of the coming open house event. This is an oldie but goodie approach to create more awareness for the event, thus making it a successful open house that will lead to fast house sale. The third open house tips for agents that want a successful open house that will lead to fast house sale is “Performance”. a.Build relationships with them:The first thing you need to do to have a successful open house event is to build relationships with your prospects. As they tour the house, engage them in meaningful conversations one at a time. It can lead to the beginning of a business relationship, you never can tell. b.Capture their information: As you engage them in conversations, ask them questions that will enable you to capture their details. c.Show them similar houses: If they seem not to be interested in the house you opened, show them similar houses, they may be interested. The fourth and last open house tip for agents that will lead to a successful open house and fast house sale is Follow up. 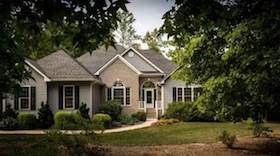 The fourth open house tip for agents that can lead to a fast open house sale is following up. Remember the leads you gathered in tip 3. Now is the time you will use it. After the event is over, you need to follow up with your prospective customers immediately after the event. Contact them by email and phone call. There are three major types of leads from an open house event. The attendees can be hot lead, active buyer or a generic attender. When crafting your follow-up message, ensure you tailor each one to the right lead. Add a call to action and use a friendly tone. Don’t forget to add your office contact details. 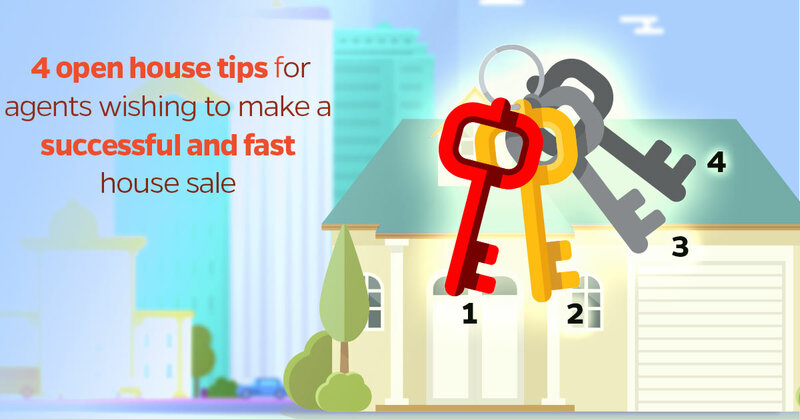 Below are some follow-up tips that will help you get a fast house sale. Send a thank you email 24 hours after the event. A week after that, call them again if they have not yet converted. Add them to your CRM, so you can send drip campaigns to them. There you have it. 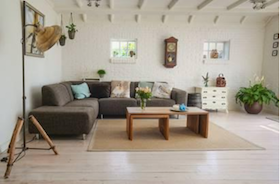 Four open house tips for agents wishing to make a successful and fast house sale. Throwing an open house event is a great way to get a fast house sale and grow your business. Do you want to get more content like this? Subscribe our newsletter and stay always updated on latest marketing and lead generation news and tips!